Been a while since I had a Random Stuff Sunday. I was in the mood, so here ya go. I don't think that it is any secret that I like coffee. Strike that. I love coffee. And I dig a good latte, now and again, as well. I just wish I could get a latte as cute as this latte. I mean, really. How could you stand to drink it? Do you love coffee? Like cats? Have a cat who drinks coffee? Thank you for popping in and have a terrific Sunday. Hi! I've been reading your web site for a while now and finally got the bravery to go ahead and give you a shout out from New Caney Texas! Just wanted to mention keep up the fantastic job! 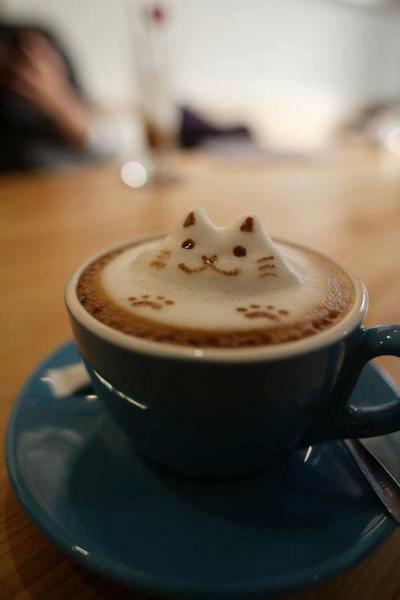 I love the cat latte - it's so cute! All my cats have tried to drink coffee before. But my dog was the worst - she drank about half a cup one time and ran around my apartment like crazy for 30 minutes.